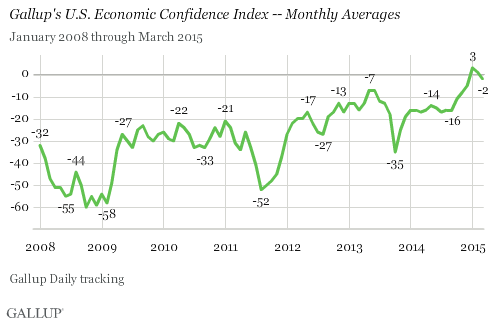 WASHINGTON, D.C. -- Gallup's U.S. Economic Confidence Index registered its first negative monthly score of 2015 in March, slipping to -2. This is down from +1 in February and +3 in January. The monthly index emerged from negative territory in January of this year after seven years of scores well below zero. February's average barely remained in the black, at +1, indicating the public continues to hold a roughly even mix of positive and negative views about the economy. 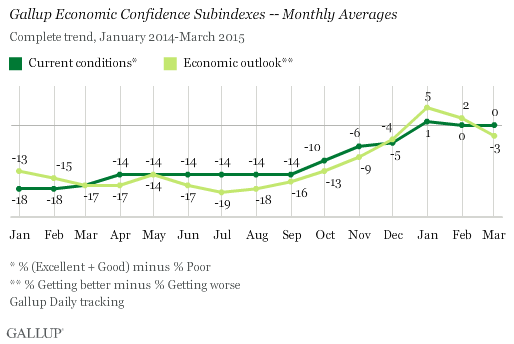 Gallup's Economic Confidence Index is the average of two components: Americans' ratings of current economic conditions and their views on whether the economy is getting better or getting worse. 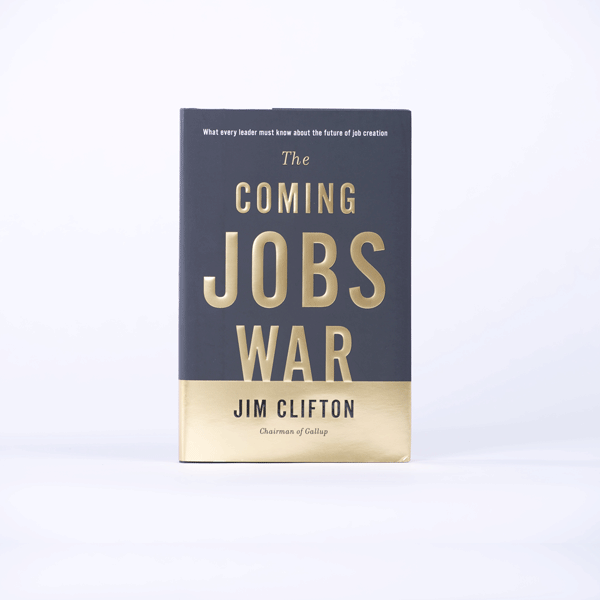 The index has a theoretical maximum of +100, if all Americans believe the economy is excellent or good and getting better; and a theoretical minimum of -100, if all Americans say the economy is poor and getting worse. In Gallup Daily tracking throughout March, an average of 27% of Americans said the economy was "excellent" or "good," while 27% said it was "poor." The resulting "0" current conditions score is the same as in February. Meanwhile, the economic outlook sank to -3 in March from +2 in February, based on 46% of Americans saying the economy is "getting better" and 49% "getting worse." People's views of the economy are strongly tied to their political identity, and whether their party is in control of the White House. Given that there is a Democratic president, Democrats (+24) last month viewed the economy much more positively than independents (-3) and Republicans (-28). This pattern has been evident since President Barack Obama took office, although the precise size of the gap between partisan groups has varied significantly as the overall index has gone up and down. The positive index among all national adults in recent months reflects a solidly positive economic rating among Democrats, coupled with an equally negative rating among Republicans. 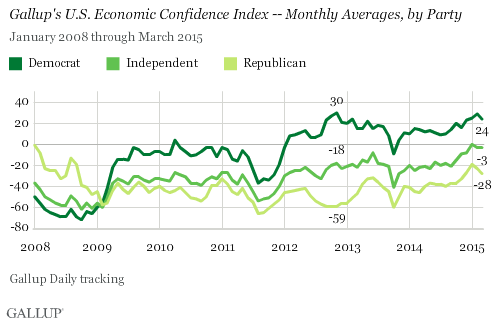 In fact, Democrats' economic confidence score has been positive nearly every month since the start of 2012, while Republicans' score has been consistently negative. Independents, meanwhile, have hovered near the middle in recent months. Prior to February's reading, the Gallup Economic Confidence Index had seen six consecutive months of increases in its monthly figure, so the slight declines in each of the past two months clearly indicate a shift in consumers' mindsets. Although Republicans are consistently more negative than Democrats about the economy, changes in the index are generally evident in all three groups. While partisanship is a component of economic confidence, it doesn't explain the recent decline. Results for this Gallup poll are based on telephone interviews conducted March 1-31, 2015, on the Gallup U.S. Daily survey, with a random sample of 15,720 adults, aged 18 and older, living in all 50 U.S. states and the District of Columbia. For results based on the total sample of national adults, the margin of sampling error is ±1 percentage point at the 95% confidence level. All reported margins of sampling error include computed design effects for weighting.